Kabale und Liebe, Love and Intrigue, Love and Politics or simply Luise Miller, are all titles for the same play written by the German dramatist Friedrich Schiller in 1784. The Donmar Warehouse in London chose Luise Miller in June and July 2011, directed by Michael Grandage, working with translator Mike Poulton on a more contemporary version of this landmark bourgeois tragedy. In the title role was East Londoner Felicity Jones, who turned down a major film role to do the play. She plays the wholesome daughter of a modest violinist in a tale of “precarious liaisons, shadowy desires, backroom skulduggery and the iniquities of class snobbery.” It’s Schiller’s answer to Romeo & Juliet with melodramatic tendencies. Her ‘mother’ was played by Finty Williams, described by one review as “a sweet natured blabbermouth”. I had drawn a sketch of the both of them with a fine black biro. Whilst waiting outside the Donmar on a balmy summer’s evening for the cast to emerge (which took a bit longer because I think the were doing a Q+A session with the audience) I drew a quick pencil sketch of Felicity with my 2B – which in the balminess became a softer 4B! This was based on a publicity photo pinned to the Donmar Wall. During the 1970s and 80s Tom Watson was one of the leading golfers in the world and he doesn’t play a bad game these days either. Pushing sixty and 26 years after his last major victory Tom led much of the 2009 Open Championship at Turnberry in Scotland but eventually lost in a four hole playoff to Stewart Clink. I remember watching the last day glued to the TV, hoping he would win. He had a chance in regulation play with a par on the last hole, but missed an eight foot putt. He is regarded as one of the greatest links players of all time, winning five Open Championships and three Senior British Open Championship titles. He’s also won the Masters twice and the US Open. In fact he was number on from 1978-1982, replacing Jack Nicklaus. Tom was back in Britain this year playing both Open Championships, so I quickly did a sketch for signing and sent it to him at Royal Porthcrawl in Wales where he played the senior championship last week. He didn’t disappoint. What a nice guy. Robert de Castella (Deeks) as one of the leading marathon runners in the 1980s. The colourful Australian, off Swiss-Italian descent, was the World Champion in 1983 and won back-to-back golds at the 1982 (Brisbane) and 1986 (Edinburgh) Commonwealth Games. He also took the Boston title in 1986. “If you feel bad at 10 miles, you’re in trouble. If you feel bad at 20 miles, you’re normal. If you don’t feel bad at 26 miles, you’re abnormal,” was one of his famous quotes. In 2013 he launched ‘Deeks’ – a chain of grain and gluten free bakeries and cafés and for good measure earned a black belt in the traditional Okinawan style of karate, Goju Ryu. His distinctive moustache made him an ideal caricature target, which I drew and got it signed when he visited my home town in Invercargill, New Zealand, as the director of the Australian Institute of Sport. Whilst watching the Glasgow Commonwealth Games yesterday, I was reminded of some of its legends, as the BBC punctuated its coverage with mini profiles of its famous past participants. Among them was Englishman David Bryant, the bowls icon. Lawn bowls as opposed to opposed to bowling of the ten pin variety in an ‘alley’. It involves rolling biased balls towards a smaller ball called a ‘jack’ or ‘kitty’. Distinctively British, dating back to the 13th Century. In fact, the game was banned by King and Parliament, fearing it would jeopardise the practice of archery which was important in battle. Given their resemblance to cannon balls, they may have been better to use them in battle instead of arrow… maybe they did. Regardless, in 1541, Henry VIII ordered that artificers, labourers, apprentices, servants and the like were forbidden to play bowls at anytime except Christmas, and then only in their master’s home and presence. A penalty of 6 shillings and 8 pence was the fine. Anyway, enough of that and back to more recent history. David was perfect for a caricature, wearing his white cap, pipe-smoking and with his distinctive delivery style with his raised leg. The English teacher was the master of the rink. Some would say god. Definitely one of the greatest, if not the greatest, exponents of the sport, along with Bowls Englands’s current CEO Tony Allcock. Together they won six world indoor pairs titles and individually too many to mention. David collected five Commonwealth Golds dating back to Perth in 1962. I haven’t checked if the King’s edict’s been revoked. If not, not a bad haul for an illegal activity. At the World Championships in Auckland in 1988 (where David won the singles title and was runnerup in the pairs) he found time in between games to sign my caricature. Alred Molina played celebrated abstract artist Mark Rothko in John Logan’s RED in London and New York. The play opened at the Donmar Warehouse in December 2009 to excellent reviews and sold out performances before moving to Broadway in March 2010, winning six Tony Award including Best Play. Marcus Rothkowitz emigrated with his family to the US from Russia as a boy in 1903. He became a central figure in the postwar American abstract expressionists, the so-called New York School. The group, who couldn’t really draw, also included Barnett Newman, Clifford Still, Franz Kline and Jackson Pollock. They sought refuge in abstractionism to camouflage their modest artists talents. RED revolves around Rothko’s last decade of his life when his palette reduced dramatically from glowing oranges and yellows to the sombre shades of red and black – banal work on a large canvas! At the centre of it is his undertaking of the Four Seasons restaurant commission in Manhattan’s Seagram Building in which he famously declared that his paintings would “put all the rich bastards off their food.” In the end, due to his moral conflict of interest, he returned the $35,000 advance and refused to have his work hung in the restaurant. Tamsin Greig said she was inspired to become an actor going to rehearsals of school plays… because it got her out of science and the only other thing she was good at was trampolining which didn’t seem to have much of a future in it. In 2010, Tamsin played Diane, a ferociously ambitious agent in The Little Dog Laughed, alongside Gemma Arterton, Rupert Friend and Harry Lloyd at the Garrick Theatre in London. By all accounts she stole the show, some critics even said “saved it”. She had all the best lines. “Tamsin Greig dominates as the lethally sharp agent, detonating every line with killer punch and timing.” Said The Daily Express. She was nominated for an Olivier Award for Best Supporting Actress (having previously won in 2007 for Much Ado About Nothing) and won the WhatsOnStage Theatregoers Choice Award. Tamsin is known for doing both dramatic and Comedic roles, although the latter generally cause problems. Sh has admitted to ‘corpsing’ which is British theatrical slang for unintentionally breaking character by laughing. When I looked at this sketch, which Tamsin signed in February 2010, I thought ‘her hands are disproportionally larger”. Taking into account some foreshortening with the left. So I looked at a number of photos of her and she does have large hands and long fingers! Art indeed imitated life. That must have been the same for Michelangelo when he was sculpting the the David statue. Sir Trevor Nunn is the Knight I would want to spend a day with. His list of productions include Les Miserables, Cats, Chess, Sunset Boulevard, Starlight Express, Piaf, Aspects of Love, A Little Night Music, not to mention just about every play by the Bard. In fact, it would be quicker to list what he hasn’t done. Not to mention his list of achievements and awards, far too numerous for this small space. Some critics consider him the finest and most versatile theatre director in the world. He was one of the theatrical icons I always wanted to meet. Since living in London over the past five and a bit years, our paths have crossed on many occasions – all of which are memorable (to me). Sir Trevor is the kind of person you can stop in the street (without security reminding you of your mortality) and ‘chew the fat’. He has always been very friendly and generous with his time and comments. He walks a lot around London. I remember waiting at the lights in Shaftesbury Avenue and he was beside me, so we walked and chatted. “Hi, Sir Trevor, how’s rehearsal for Birdsong going?” I would say. “I’m going there now,” as we both headed towards the Comedy Theatre. He’s always wearing his denims – something he has been doing since 1961. Elizabeth Grice in an interview with Sir Trevor earlier this year in The Telegraph mentioned this fact in connection with his youthfulness. She said of the 74 year old: “if I mistype him as 47 it seems to make more sense… his thick, dark hair, also c. 1961, is still, improbably thick and dark. He might be the scruffy boy who has strayed in through the stage door to get autographs.” Now, that sounds familiar! I drew this quick ink sketch which he signed for me at the front door of the Theatre Royal Haymarket on the opening night of Rosencrantz and Guildenstern Are Dead on a balmy June evening in 2011. One of my favourite songs is ‘Send in the Clowns’ from Stephen Sondheim’s 1973 musical A Little Night Music. I’m not sure why I like it – the haunting melody, the lyrics or maybe as a political cartoonist it’s simply metaphorical. Sondheim that it was about fools and foolishness. It’s the show’s big number – a ballad from Act II in which the character Desiree reflects on the ironies and disappointments of her life after her marriage proposal is declined. The song became a major pop hit when first Judy Collins recorded it in England, then Frank Sinatra heard it and also recorded it. It won the Grammy in 1976 for Song of the Year. Since then it seems that every person who sings has recorded it, including Barbra Streisand, Shirley Bassey, Olivia Newton-John, Elaine Paige…. even Krusty the Clown of The Simpsons. Sir Trevor Nunn’s 2009 production – the third London revival – started life at the Menier Chocolate Factory before transferring to the Garrick Theatre. The wonderful Hannah Waddingham played Desiree, the touring thesp, self-absorbed, once-successful actress who rekindles her love affair with a benign middle aged lawyer, now married to an 18 year old. Kelly Price played Charlotte, the tolerant wife of Desiree’s lover Count Carl-Magnus Malcolm. Both ewere nominated for Olivier Awards. Getting this sketch signed was a bit of a mission. I eventually caught up with Kelly after a performance of The Misanthrope at the Comedy Theatre in March 2010 and Hannah signed in August at the Regent’s Park Open Theatre where she was appearing in Into The Woods. In 2010 British actress Lydia Leonard played the role of Jackie Onassis in Martin Sherman’s play Onassis at the Novello Theatre in London, alongside Robert Lindsay in the title role. The ex-Mrs John F. Kennedy married Aristotle Onassis, Greek shipping’s biggest player. “I don’t think I’d have like her, had I met her,” Lydia told a journalist. “My sympathies lie entirely with Maria Callas,” (with whom the shipping magnate had a doomed affair – Maria called it ‘Marilyn Monroe plays Ophelia’). Hanging around the Novello stage door, which has zilch cover, in the middle of winter is no fun, but the Onassis cast were. I drew a few sketches – mostly quick montages with the soft 4B lead – to capture the characters energy. It took a few visits in rain, hail and sign, but a very pleasant way to start 2011. Lydia is currently playing Anne Boleyn in a double bill of Hilary Mantel’s novels Wolf Hall and Bring up the Bodies at the Aldwych. British actress Jenny Agutter won the BAFTA Award for Best Actress in a Supporting Role for her role as Jill Mason in the film Equus in 1977. Thirty years later she appeared in the stage version of Peter Shafffer’s most powerful play at the Gielgud Theatre in London alongside Richard Friffiths and Daniel Radcliffe. This time she played Hesther Saloman, the magistrate who brings Alan Strang (Radcliffe) to Martin Dysart (Griffiths) the psychiatrist, for blinding six horses. Many moons ago I directed Equus for Invercargill Repertory back in New Zealand. When I sent Jenny this portrait sketch to sign at the Gielgud in 2007 I mentioned it in the accompanying note. 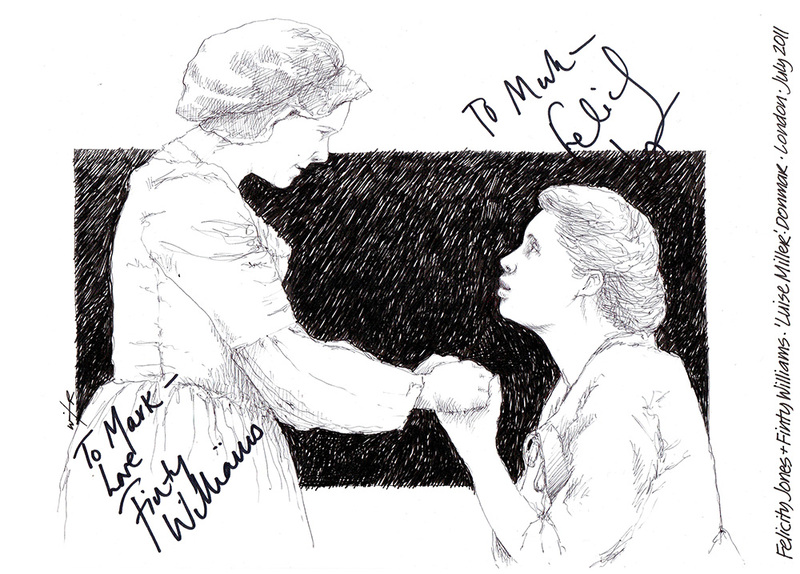 She not only signed the drawing, but wrote a lovely letter about the productions. I had to the privilege of meeting her briefly when she attended the Captain America: A Winter Soldier premiere earlier this year in London, which confirmed my impression of her as one of the most enchanting people in the business.